Don't you just love mixing and matching colors, patterns and shapes to create the perfect dining room ensemble? It's like getting permission to color outside the lines and ending up with something that's totally unique. These chairs and tables by top of the line designers are youthful and spirited, embodying today's definition of modern elegance and adding a sense of fun and creativity to the home. With any of these dining room furniture sets, you'll introduce personality and elegance to your space, creating the perfect atmosphere for a dinner party or casual meal. 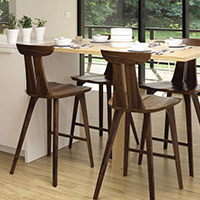 These dining tables and chairs are great for... wait for it... the dining room. What better way to introduce your guests to your out-of-the-box design style? This style of modern furniture is comfortable and impressive, casual enough for every day dining and yet easily dressed up for the formal dinner. And who says dining furniture has to be bland and boring? The heart of the house is one of the best places to add a fresh layer of fashion-forward design. First, you'll need a table to grace your dining area and become the focal piece of the room. Consider the layout of the room and the lighting in the room to decide if you need a round dining table or a rectangular table. Next, you'll choose the assortment of chairs to accompany the table. From contemporary side chairs to elegant arm chairs and taller counter stools, you'll find seating options that can pair with any type of table. And finally, take a look at the storage furniture options to keep your room organized for any occasion. The dining room will play host to exceptional dinner parties and you'll need well-chosen furniture to show off your style. Gus Modern offers a collection of mid-century inspired furniture that finds its home pleasantly on display in the dining room. 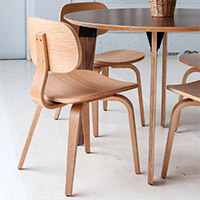 Kartell's collection includes dining tables and chairs made from durable plastic fashioned into modern shapes and styles. Wooden dining furniture is perfected by Copeland and if you need something that is clean and contemporary, look to Blu Dot. Finally, if you plan to include a buffet table in your dining room, look to the high-quality Italian designs from Calligaris. 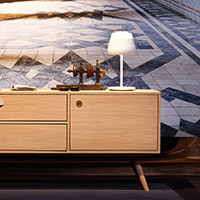 Any combination of furniture found in this assortment is guaranteed to impress. Space is everything when it comes to selecting furniture for your dining room. You'll need to carefully consider the size and layout of your dining area to choose the best table, chairs and other furniture pieces. The best mix of furniture for the dining room is the combination that helps to create an inviting presence while working well with the existing lighting and decor in the area. For example, if you have a round chandelier suspended from your ceiling, it will be best suited with a round dining table. Color also plays an important role with dining furniture. Vibrant chairs are best suited to a popping dining room, while elegant wood finishes are capable of fitting in almost anywhere. Finally, try to select furniture that will appropriately accommodate upcoming occasions like an extension table for holiday parties or a bench as an additional seating option. If you have any questions about the dining room furniture featured here, please call 877.445.4486. Saloom Furniture is another exceptional designer of wooden dining furniture including luxurious tables and chairs. And with modern furniture in place, you may enjoy upgrading your lighting too. For most elegant dining rooms, you can complement the furniture with a well-placed chandelier or a mix of ceiling lights and wall lights. If you choose to have a buffet table in the space, make sure it is well-lit with a console lamp. And don't forget to complement your new dining room furniture set with some fun modern kitchen accessories--fun, functional, fabulous!